For eight years, the NCBLA worked with a talented team of editors and designers at Candlewick Press to create Our White House: Looking In, Looking Out. 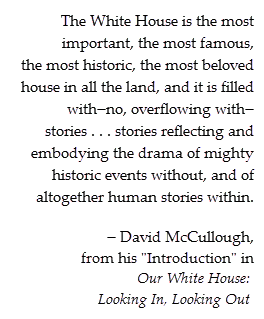 We are thrilled, and grateful, that a number of award-winning authors and illustrators have contributed their work to this remarkable creative effort; not one contributor has received any financial reimbursement for this project. Stephen Alcorn, Gigi Amateau, M.T. Anderson, Jennifer Armstrong, Jeannine Atkins, Tony Auth, Natalie Babbitt, Mary Brigid Barrett, Sophie Blackall, Jess M. Brallier, Calef Brown, Don Brown, Joseph Bruchac, Robert Byrd, Meg Cabot, Eric Carle, Nancy Carpenter, Joe Cepeda, R. Gregory Christie, John Y. Cole, Michael Cooper, Susan Cooper, Marguerite W. Davol, Kate DiCamillo, Diane Dillon, Leo Dillon, Carol Dyer, Jane Dyer, Timothy Basil Ering, Lou Fancher, A. G. Ford, Russell Freedman, Tony Fucile, Jean Craighead George, Leonid Gore, Max Grafe, Nikki Grimes, Barbara Harrison, Kevin Hawkes, Homer Hickam, Lee Bennett Hopkins, Polly Horvath, Bagram Ibatoulline, Paul B. Janeczko, Steve Johnson, Stéphane Jorisch, Steven Kellogg, Barbara Kerley, Ralph Ketcham, Elizabeth Cody Kimmel, Bob Kolar, Kathleen Krull, Jim LaMarche, Stephanie Loer, William Low, P.J. Lynch, David Macaulay, Patricia MacLachlan, Gregory Maguire, Leonard S. Marcus, Albert Marrin, Petra Mathers, David McCullough, Emily Arnold McCully, Megan McDonald, Fredrick L. McKissack, Patricia C. McKissack, Milton Meltzer, Wendell Minor, Barry Moser, Roxie Munro, Walter Dean Myers, Claire Nivola, Linda Sue Park, Katherine Paterson, Richard Peck, Stephanie True Peters, Matt Phelan, Jerry Pinkney, Tom Pohrt, Don Powers, Jack Prelutsky, James Ransome, Chris Raschka, Mike Reagan, Lynda Johnson Robb, Barry Root, S. D. Schindler, Jon Scieszka, Brian Selznick, Chris Sheban, Anita Silvey, Peter Sís, David Slonim, David Small, Jerry Spinelli, Sarah Stewart, Matt Tavares, Mark Teague, Stephanie S. Tolan, Chris Van Dusen, Diana Walker, Andréa Wesson, Terry Widener, Nancy Willard, Mark London Williams, Michael Winerip, Virginia Euwer Wolff, Jane Yolen, Ed Young, James Young, M.D. 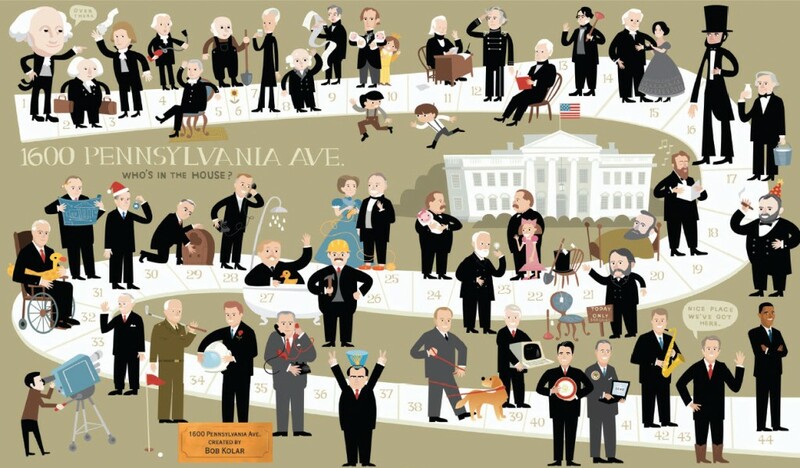 Illustrator Bob Kolar’s presidential game titled “1600 Pennsylvania Avenue: Who’s in the House?” is just one of the many original illustrations included in Our White House: Looking In, Looking Out. Illustration (c) 2008 by Bob Kolar.